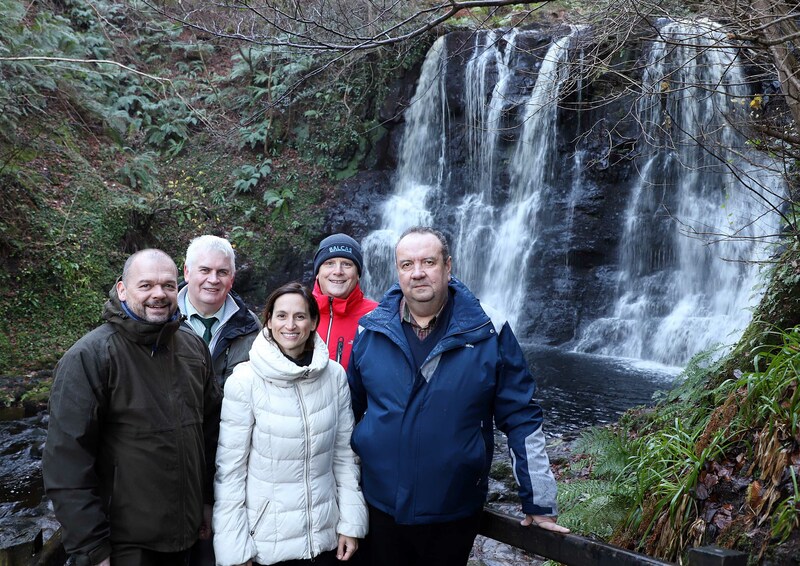 State Forestry leaders from across Europe recently had the opportunity to share experiences about European forestry and view forests in the Glens of Antrim during a three day visit to Northern Ireland (NI), hosted by the Department of Agriculture, Environment and Rural Affairs (DAERA). The visit was held back-to-back with the strategic discussions on the new EUSTAFOR strategy for the coming years. Staff from DAERA’s Forest Service recently hosted a three day visit to NI by a group of forestry leaders from across Europe. A range of issues were discussed with The European State Forest Association (EUSTAFOR), which included the development of sustainable forests, plant health and showcasing the excellent facilities available for tourists and local communities within our forests. The visit culminated with a tour of the scenic Antrim Coast and Glens. Pictured at the Glenariff Forest Park Waterfall are (from left to right): Piotr Borkowski, Executive Director EUSTAFOR, Brussels, John Joe O’Boyle, DAERA Chief Executive Forest Service, Dr. Sara Lucia, Maltoni, Head of Integrated Forest Management, Sardinia, Italy, Brian Murphy, Chief Executive, Balcas Timber and Ciprian Pahontu, National Forest Administration-Romsilva, Romania. Photo DAERA Press Office. During a tour of forests in the scenic Antrim coast and Glens, staff within DAERA’s Forest Service discussed a range of issues with The European State Forest Association (EUSTAFOR), which included the development of sustainable forests, plant health and showcasing the excellent facilities available for tourists and local communities within our forests. Chief Executive of Forest Service, John Joe O’Boyle, said: “EUSTAFOR members were able to view the outworking of our practices and strategies during a visit to Glenariff Forest in the scenic Glens of Antrim Coast. Piotr Borkowski, Executive Director of EUSTAFOR, said: “EUSTAFOR is very grateful to the Forest Service of Northern Ireland for inviting the strategic seminar on the future objectives of our associations to Belfast. This meeting is a significant contribution to further enhancing the co-operation among the European State Forests Management Organisations in advocating the multiple roles and benefits of sustainably managed state forests to the broad society. The results will be presented to the General Assembly in March 2019. “We are happy that this milestone was achieved in Northern Ireland. Furthermore, the presentations of practical forest management aspects during the field session at Causeway Coast and Glens made state forests managers from all over Europe familiar with specific features of Northern Ireland’s forestry and its benefits for the local people”. The European State Forest Association (EUSTAFOR) represents state forest companies, enterprises and agencies that have sustainable forest management and sustainable wood production as major objectives. The Association currently has 34 members in 23 European countries. NI Forest Service is an Associate member. All media queries should be directed to the DAERA Press Office on 028 9052 4619 or email pressoffice.group@daera-ni.gov.uk Out of office hours please contact the duty press officer on 028 9037 8110.